gracious enough to explain and answer some of the flags I had put in my notes regarding topics I didn't understand and was going to have to look up when I got back, but Ben gave me a big head start. Thanks Ben! I said that I attended the physics colloquia at UCI and he encouraged me sit in on the astrophysics colloquia as well. When I got back to the observatory, Astronomer Assistants Danny and Ruby licked me and kissed me as if I had been gone forever. Even Resident Astronomer Peggy gave hugs and kisses. Everybody missed me, as I did them too, everyone that is except for Astronomer Assistant Willow, who apparently was miffed that I was gone and wouldn't have anything to do with me. Later, when Ruby and Danny were out for a walk, Willow came up and jumped in my lap and rubbed all against me and said all was forgiven. Thank you all for all your support during this journey! Finally, I wanted to make a few more summary comments about the sessions that were significant to my amateur way of thinking, but before that, I wanted to remind everyone about the upcoming UCI Physical Sciences Breakfast on Tuesday, January 10. Be sure to reserve and get your free breakfast (but not free parking) and I will see you there. One of the questions I asked Ben was what is the luminosity function? Several times during the meeting sessions, presenters talked about the luminosity function and how they were using it do some such thing or another and I was lost on just exactly they were talking about. Well, Ben had no trouble in telling me what it meant, so when I got home I looked up luminosity function in one of textbooks to get some more detail and maybe an example. 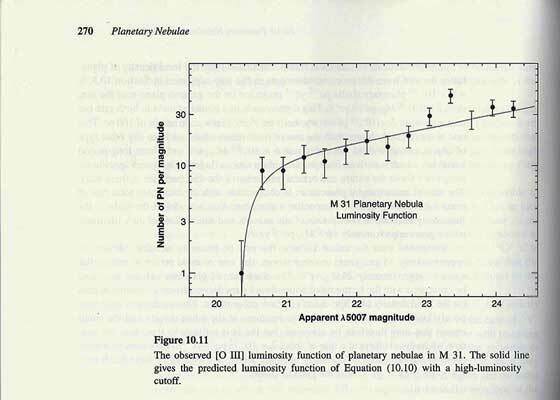 Check out the luminosity function below, which was abstracted from "Astrophysics of Gaseous Nebulae and AGN" by Osterbrock and Ferland. I also looked up the abstract for PhD to Be, Ben's, talk titled "Circumnuclear Disks in Early Type Galaxies: 12CO(1-2) and Continuum Properties". Wow, I can sort of see what that is about, but it took me a while to read through the abstract. One of the things I liked about many of the presentations at this meeting, just like this one, is the amount of time taken to talk about the methodology used to collect the data. Yes, the conclusion and summary and findings are important, but the discussion about how the data was collected and how the possible sources of error have been reviewed and removed and how the results are analyzed and found to be statistically significant, is all part of the scientific method. In this case, I found that Ben used data from the Atacama Large Millimeter Array (ALMA) in Chile that collects mm wavelength microwave signals, in lieu of optical wavelengths. It turns out that mm wavelengths are often associated with molecular compounds, in this case carbon monoxide, which is used as a tracer for the rest of the material that makes up the target galaxy. Other papers described how ALMA was being used to trace the location of many organic molecules around the universe. 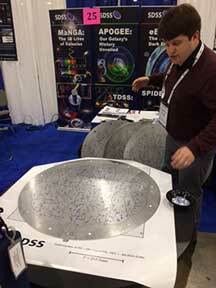 I stopped by the Sloan Digital Sky Survey (SDSS) booth on the exhibit hall, where they were displaying some of the aluminum disks that were drilled with holes where the target galaxies would be found in the telescope image and fiber optic cables are inserted to carry that image to the multichannel spectrograph. The SDSS Apache Point Observatory is located in New Mexico. Several hundred target galaxies can be measured simultaneously on the same night observation run. The telescope tracks across the night sky and the multichannel spectrograph measures each galaxy at the same time. Before this innovation, the typical spectrographic telescope could only do one or two galaxies per night. This is how the SDSS survey catalog can have millions of galactic spectra on file. Now, one of the jobs at the SDSS observatory is for someone to place one end of a fiber optic cable in the disk and the other end into one of the input channels on the spectrograph. The fibers don't have to be identified individually because a special camera setup is used to look for light through the fiber and identify where it is found to be inserted and just lets the computer controller know which fiber goes to which channel. The person inserting the fibers does not need to keep track of anything. Finally, this a job that even I could do to help astronomy move forward. Can I sign up? The other area on the exhibit hall floor which was very well attended, besides the morning coffee service, was the hundreds of posters and presenters discussing all the ins and outs of their astronomical project. I just took a picture of one of the photos. This poster was one of which I could almost understand the title. Many of the posters had titles that I could have spent several minutes just trying to understand the title, without even trying to get to the rest of the poster. Nonetheless, many presenters were very helpful in explaining what was going on. So, it was fun just wondering around with a cup of coffer trying to not get in the way of real scientific discussions that were going on, while at the same time trying to learn at least a little bit. Since I was just in the process of trying to collect images of the binary eclipsing system Algol, it was interesting to see what the professionals were up to. 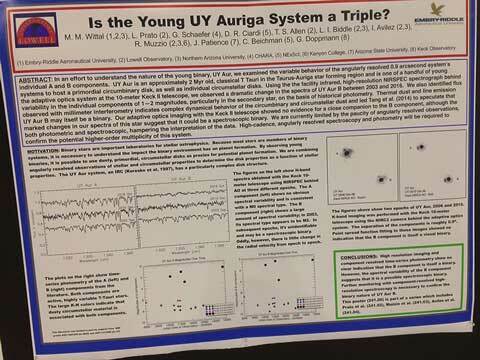 A closer examination of that poster reveals that the authors were using the 10 meter Keck telescope, with attached adaptive optics to help out too, and here I am just trying to duplicate capturing the Algol eclipse, where Algol remains visible to the naked eye (in dark skies) the entire eclipse cycle. Oh well, you have to start somewhere and amateurs can learn a lot by trying to duplicate some of the same techniques. One thing I noticed about the posters is that they all now seem to just be printed on one big piece of paper or plastic, which is very nice and easy to carry and setup. You could see lots of attendees running around with their little round shipping tubes with their posters inside. I remember when I first made a poster session presentation at an engineering conference, We had prepared a paper for the power quality conference in Boston and were given a chance to discuss it at the poster session. At that time, I had to put up a dozen or so 8.5 x 11 pieces of paper. At that particular conference we were not allowed to use thumb tacks and had to use tape and I brought some easy to release tape for my poster. As luck would have it, the easy release tape did not hold the papers on the wall for very long, so I spent a great deal of my time in front of the poster just resticking the pages that had started to fall off. Fortunately, one of the other presenters took pity on me and offered some of his good sticking tape. So, I can certainly appreciate the poster being printed all on one large piece. I have a whole notebook full of other observations at the meeting, covering especially the dozen other plenary sessions, but this maybe is enough to give you a sense as to what it was all about. I find I learn so much about astronomy, not only be attending the presentations, but by seeing the discussion that goes on before and after and the questions asked, that fills in the rest of the story not completely told in the official presentation. I learn of some topic or feature that I know nothing about and then when I get back and start to study, I find that when I come across some description of that topic, that now it makes much more sense as to what and why it is important.